Time flies so fast, here is another weekend and I had no time to post in the meantime. Let's see your beautiful flower! Here are my azalea flowers, the last ones taken at the garden center. I was very sad the last time I visited there, employers have changed and photographers are not welcome any more. But so is life, something is always changing. 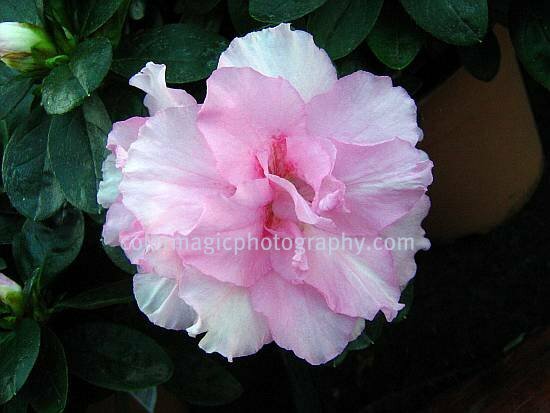 These are small, potted azaleas, sold as indoor plants. 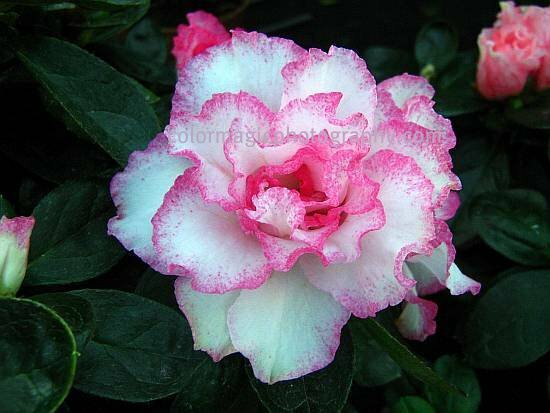 See photos of tall, outdoor azaleas. 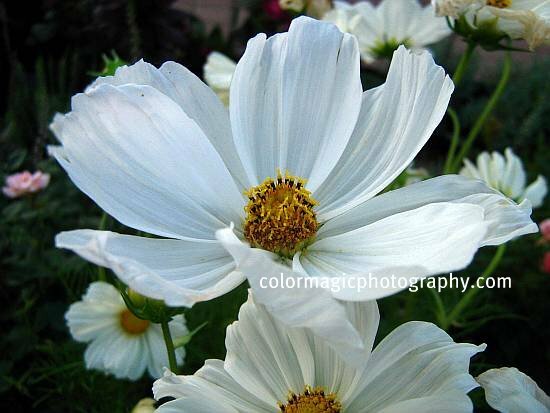 Join Macro Flowers Saturday and share your beautiful flowers! I'm almost an hour late and I'm very sorry for that but now we can start a new weekend flower show. Let me see your gorgeous flowers from around the world! Unlike the closely related Brugmansia, datura flowers are erect, not pendulous with colors varying from white to yellow, pink, and pale purple. 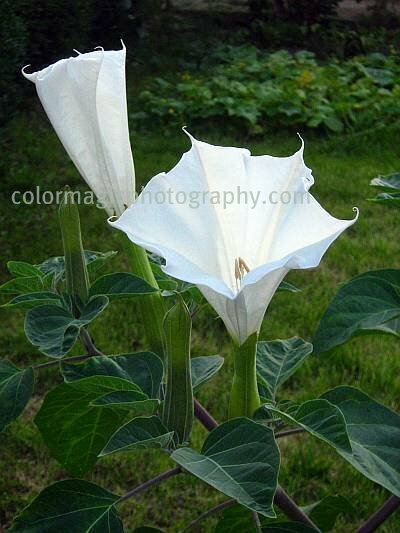 All datura species are poisonous, deliriant and sometimes used as a hallucinogen. 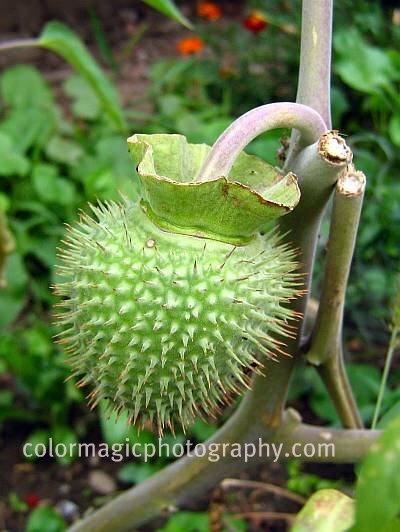 This is the Datura wrightii or Sacred Datura, a poisonous perennial plant often used as ornamental flower in gardens. 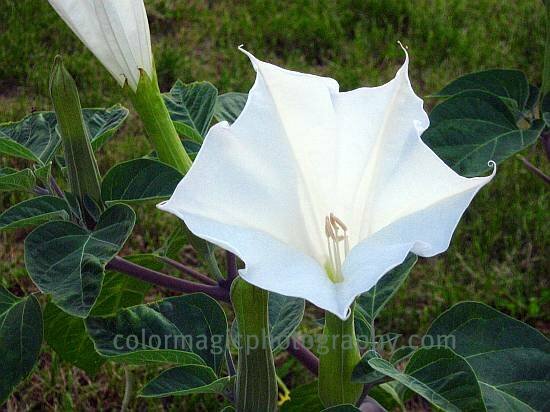 This herbaceous perennial grows 30 cm to 1.5 m tall and wide and it's often confused with the Angel's trumpet or Jimsonweed - Datura stramonium. Its leaves are broad and rounded at the base. The flowers are strikingly beautiful, with sweetly fragrant white, 5-toothed trumpets up to 20 cm (8 in) long. It blooms from April to October, but its the first time that I see one. The flowers open at nearly full dark (as you can see on the photo) and wither a few hours after sunrise the following morning. In cloudy weather, they may open earlier and last longer. As by other Datura, the fruit is a spiny capsule, the well known thorn-apple, splitting open when ripe to release the numerous seeds. Angel's trumpet (Datura stramonium) has smaller flowers, tooth-edged leaves and 10-toothed flowers, compared with Sacred Datura. Datura wrightii is sacred to some native Americans but also used to induce a "recreational hallucination". Similar to Datura stramonium, the plant can induce auditory and visual hallucinations, sometimes ending in a tragedy. The plant contains Scopolamine that takes away a person's vision and so the panicked consumer becomes involved in accidents. Now comes the worse part: administering anesthesia in the hospital, combined with the Datura, is usually fatal due to respiratory depression. 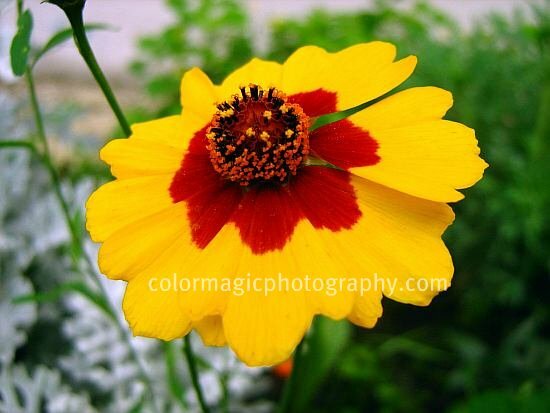 Join the list and share your beautiful flowers from your part of the world! 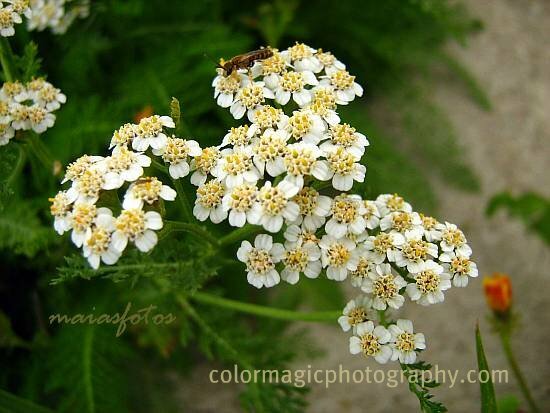 Yarrow-Achillea millefolium is a member of the aster family, native to the Northern Hemisphere. There are not many plants with so many names and legends like the yarrow. Popular in European folk medicine, yarrow has a long history as a powerful healing herb used for wounds, cuts and abrasions. It was called by the Ancients, the Herba Militaris, the military herb, for its use in staunching the flow of blood from wounds. Achilles, the Greek mythical figure stanched the bleeding wounds of his soldiers, hence the name of the genus, Achillea. Other common names such as Staunchweed and Soldier's Woundwort also reflect this medicinal action of the plant. 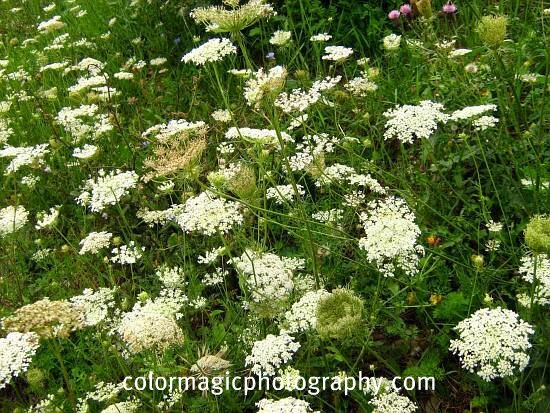 Yarrow is frequently found in meadows and along roadsides, blooming from June to October. The stem of the yarrow is angular and rough, emerging from taproots. The flowers are produced at the top of branches in flat-topped, compact clusters. 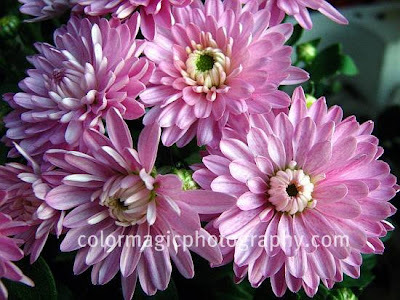 Flower color is typically white, but pink or pale purple flowers are common as well. Leaves are 5–20 cm long, alternate, feathery, with many finely detailed tiny leaflets. The basal leaves are longer than those growing on stem, usually displaying a gentle downward curving arch. Its popular names, Milfoil and Thousand Weed are derived from the many segments of its foliage. The whole plant is more or less covered with white, silky hairs. Both flowers and leaves have a bitterish, astringent, pungent taste. 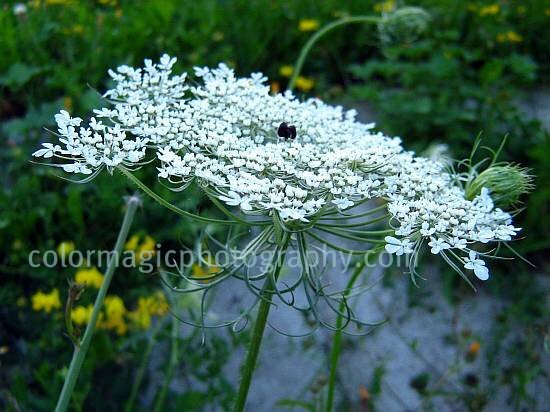 Yarrow is a diaphoretic, astringent, tonic, stimulant and mild aromatic herb. The most medicinally active part of the plant is the flower. Decoctions have been used to treat inflammations, such as hemorrhoids, and headaches. Infusions of yarrow, taken either internally or externally, are said to speed recovery from severe bruising. Very confusingly, the name Nosebleed describes yarrow's property of stanching bleeding of the nose but also causes a bleeding from the nose when the leaves are rolled up and applied to the nostrils, which will thus afford relief to headache. The yarrow seems to act either way. It has been employed as snuff for its mild stimulant effect. On account of the pungency of its foliage it's also called Old Man's Pepper and Old Man's Mustard. Old folk names for yarrow are very suggestive and descriptive for the plant's wide and various uses, like in witchcraft; Yarrow was one of the herbs dedicated to the Evil One, in earlier days, being sometimes known as Devil's Nettle, Devil's Plaything, Bad Man's Plaything, and was used for divination in spells. Today, Yarrow is valued mainly for its action in colds and influenza, and also for its effect on the circulatory, digestive, excretory, and urinary systems. Yarrow essential oil, extracted by steam distillation of the flowers, is used as an anti-inflammatory or in chest rubs for colds and influenza. 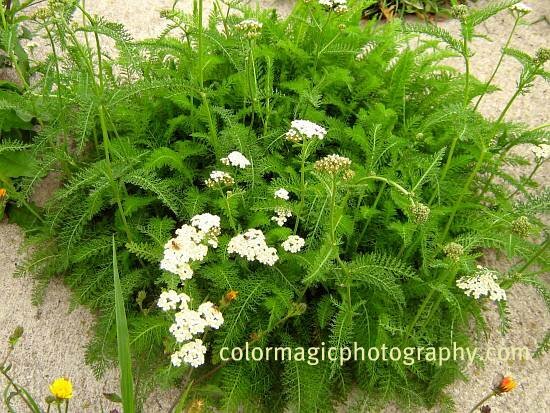 Care must be taken when harvesting the flowers; Achillea millefolium can be confused with Water hemlock, (Cicuta) all parts of which is highly poisonous. 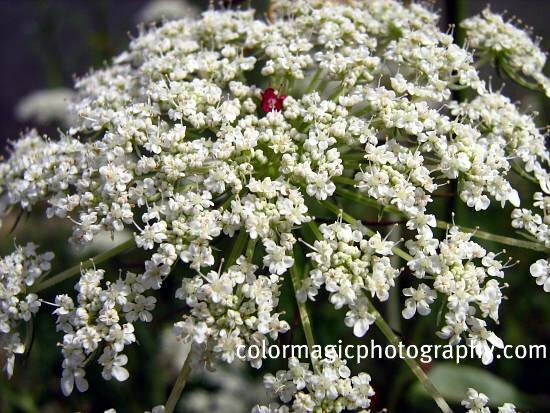 Water hemlock has a large swelling at the stem base that is not present by Yarrow plants. 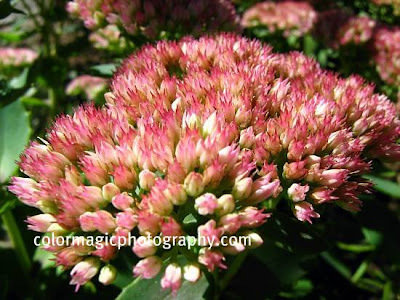 Here we are at a new edition of Macro Flowers Saturday and a new weekend. What new flowers are blooming at this time, at mid August in your gardens? In our parts autumn flowers are started to bloom and though I'm glad to see them, their appearance signals the end of summer. Autumn Joy is almost open on sunny places, others are in buds. A few lovely cosmos flowers are still holding. 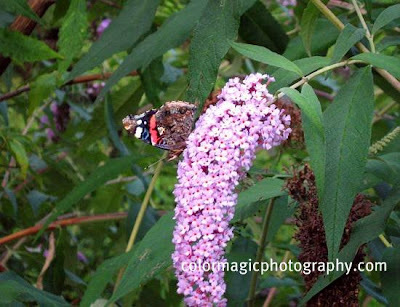 A Red Admiral butterfly is collecting the last pollen of a butterfly bush flower. 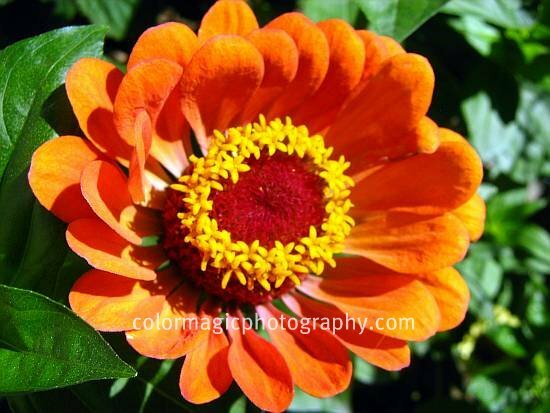 Zinnias are dressed in their faded autumn colors but still beautiful. There are many others but they don't fit all in one post. This list is closed. Visit the page with this week's participants. "You again, with you camera! Can't you see I'm busy? 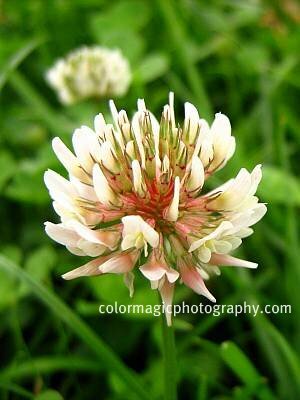 Of course, this is the White clover! You, simple humans call it a weed, you don't even know where your honey comes from. 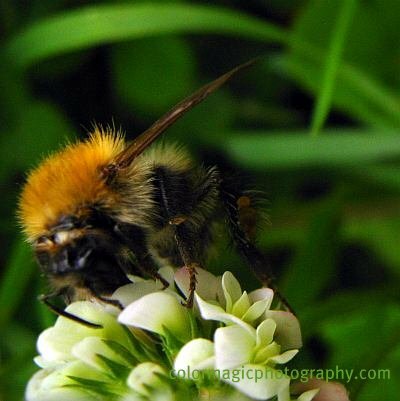 Let me tell you, clover is one of the favorite flowers of long-tongued bees. It makes a delicious honey, just ask the honeybees. 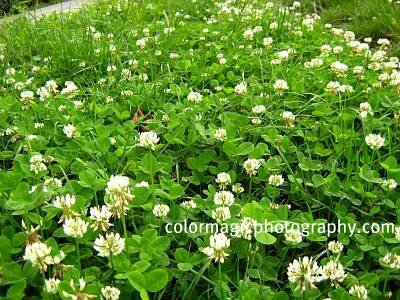 White Clover has a high ecological value to wildlife and not only; large hoofed animals, like cattle, horses and sheep also graze on the foliage of clovers. Don't waste your time, you will not find any four-leaf clover in this lawn, I checked. Do what you have to do and let me collect this pollen here, to feed my babies. These white clover flowers will turn brown and will be replaced by seedpods soon." Sorry for the hustle bumblebee, wildflowers are my newest attraction. 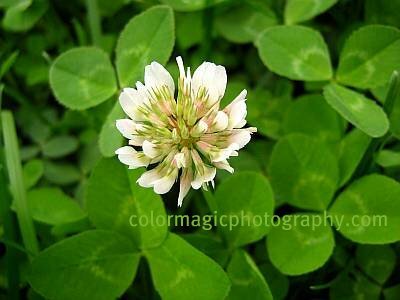 The White clover-Trifolium repens has a blooming period of several months, from late spring through the fall. The flowers are produced in ball-shaped clusters on flowering stalks that are a little taller than the foliage. The inflorescence is composed of 40 to 100 tinny, pea-shaped, white to pink flowers. The compound leaves are composed of three oval leaflets with finely serrated margins. Generally but not always, a characteristic, white marking, with the form of an upside down V, is to be seen across the upper surface of each leaflet. White clover reproduces by its creeping stems (stolons) rooting at the nodes and by self-seeding as well. It is able to grow and provide green ground cover in poorer soils. For its ability to fix nitrogen and out compete lawn weeds, white clover is considered to be a beneficial component of natural or organic lawn. 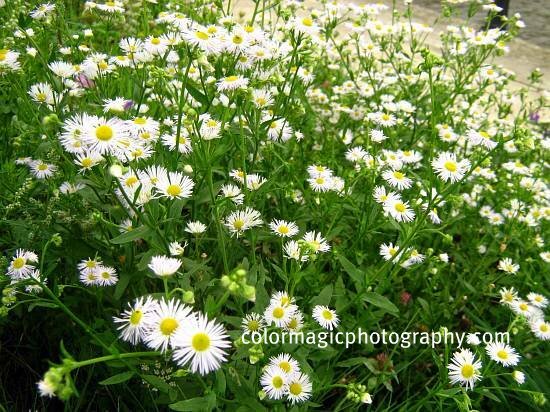 Daisy Fleabane - Erigeron strigosus is an upright annual or biennial plant in the Aster family (Asteraceae). 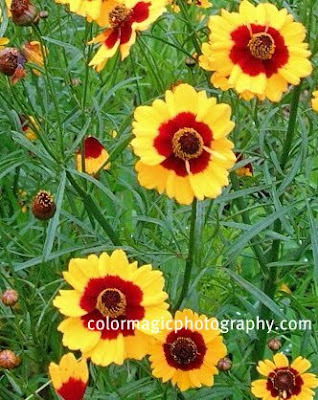 It has a worldwide distribution in temperate regions, growing on roadsides, meadows, disturbed areas but in flower gardens as well. 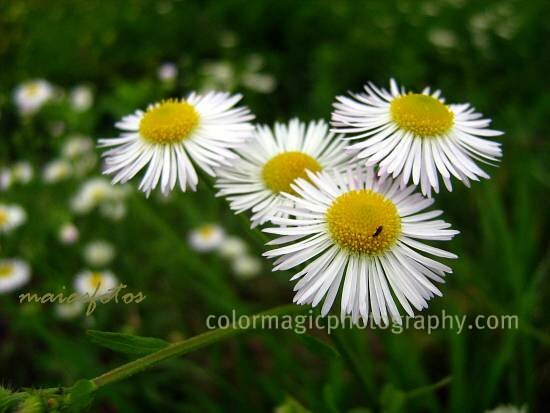 Daisy Fleabane has narrow, ovate leaves, sometimes with a few coarse teeth toward their outer tips. The tinny, about 1cm across, flowers are produced in cluster, on side stems, from June to early autumn. 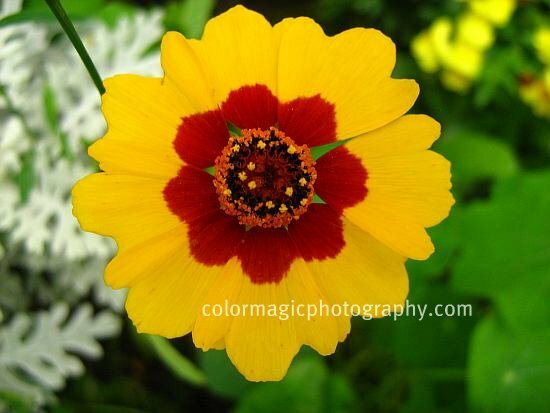 Very narrow, white petals (ray florets) are surrounding the yellow center of the flower (disk florets}. Being a self-seeding annual, Daisy Fleabane is often seen forming small colonies. Welcome to Macro Flowers Saturday #66! I can't wait to see your beautiful flowers. 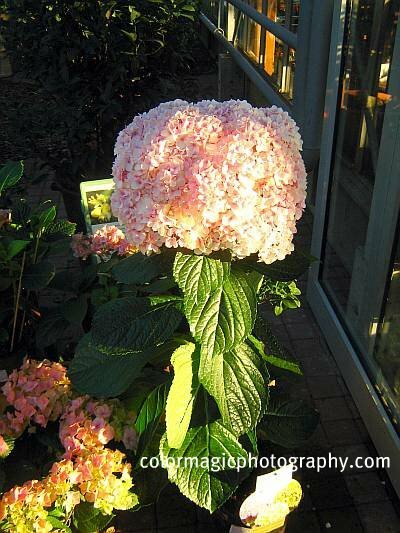 I have something unusual for you today: giant hydrangeas. 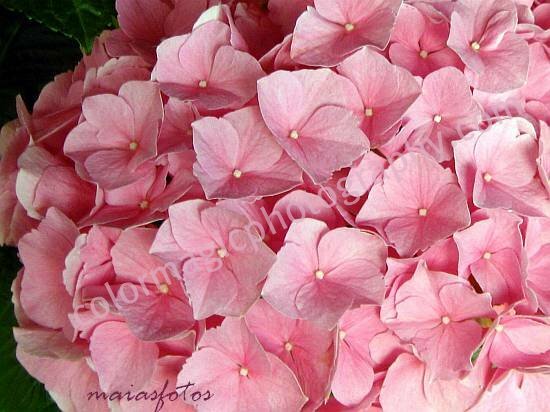 Hydrangea to some, Hortensia to others, they have different meanings in different parts of the world. Whether delicate pink or striking neon blue, they can all be a breathtaking summer display. To some it is a symbol of ego and vanity, to others a symbol of repayment for understanding. 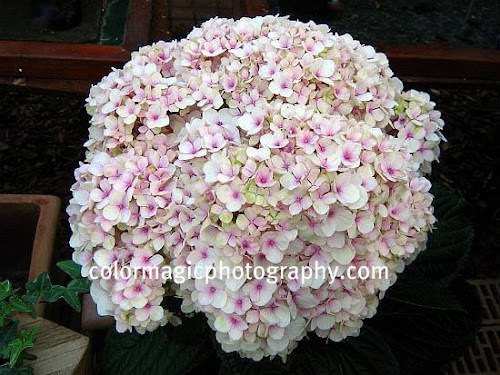 Pink hydrangeas generally mean, "You are the beat of my heart". "The light delicate blush of the petals reminds me of a beating heart, while the size could only match the heart of the sender!" 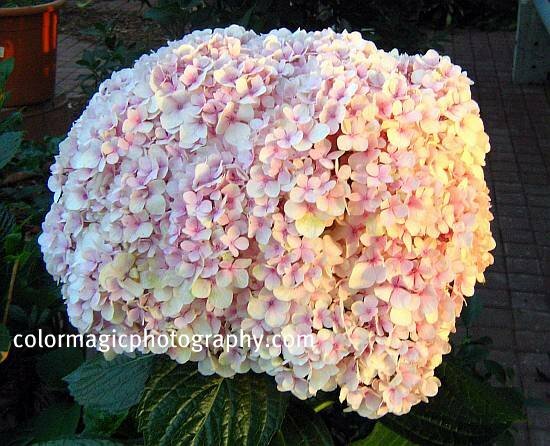 If that is so than I have a very big heart today, like these giant hydrangea flowers. These hydrangeas have a huge flower head, about twice the size of a human head, not to mention that they are just young plants. They have them at the garden center but there was no reference to the species. I've never seen anything like this in "real life", have you? Here is a slightly different shade with some purple in the middle of the tiny flowers. At the bottom-left corner of the next picture there are some young, normal hydrangea plants, for comparison. Click to see more hydrangea photos.